So you’re shopping for a late model used car and you’re an enthusiast. That means your buying priorities list goes something like 1) manual transmission 2) eight cylinders. But you’ve got a family, or you haul cargo or people or a dog around and you need more space than a Mustang or a Camaro can provide. So you are looking for an eight-cylinder manual gearbox midsize sedan, and you don’t want front wheel drive. That’s a tough list. There hasn’t been much in that segment since the 1980s. But there is one. Notice that I’ve been saying eight-cylinder, but not V8. That’s because in the mid-2000s, one company thought that a midsize, affordable eight-cylinder sedan would be a great idea. But they didn’t use a conventional V8. They made a W8. That’s right, a W8. The Ferdinand Piëch days at Volkswagen were a strange time. A company that built its reputation on air cooled four cylinders and turbo diesels wanted to move upscale. Mercedes was moving down into VW’s market with cars like the A and B-Class, and Piëch wanted to push back. That’s how we ended up with cars like the Phaeton, a Volkswagen S-Class competitor. Piëch also brought us the Bugatti Veyron, the on and off fastest car in the world. A monster that produced more than 1,000 hp. But to fund cars like the Veyron and Phaeton, they needed to spread out development costs. They needed an engine that they could spread around to different models, or at least make it modular so they could easily use one architecture to build multiple engines that could go in several cars. Volkswagen had long been making their VR6 engine. That was a V6 where the vee angle was only about 15 degrees. That meant that the cylinders actually overlapped, rather than being several inches apart like a conventional V6. That let six cylinders fit in the place of four. For their new family of engines, they took the same idea but added more. The W series of engines was largely two VR6 engines sharing one crankshaft. It was compact and could fit in most of their lineup. They could build it as a 12-cylinder W12, or cut some cylinders off and make a W8. Stick two of those together and you have a W16! So that’s what Volkswagen did. The Passat got a W8 to help increase sales volume for the engines, the Phaeton got a W12 for luxury flagship credentials, and the Veyron got a W16, for 1,000+ hp. Which brings us back to our Find of the Week. That mythical eight-cylinder, manual transmission, reasonably priced midsize sedan. For three short years, from 2002 to 2004, Volkswagen put the gloriously complicated W8 engine in the midsize Passat. But since they are Volkswagen, and at the time their slogan was “Drivers Wanted”, they also put a six-speed manual transmission behind that engine. They even gave it all-wheel drive, because V8 torque and front wheel drive don’t get along. The car put out 271 hp and 258 lb-ft of torque from a 4.0L W8. When it came out, it was pitched as a Mercedes E430 competitor, with similar power but for less money than a six-cylinder E320. And on paper, it looked like a reasonable comparison. But as is often the case for a car swinging above its price point, especially one that’s unusual, the Passat W8 was never really a hit. The car was sold here from 2002 to 2004, and fewer than 5,500 were sold in North America. Less than 600 of those were sold with a manual transmission. That makes our Find of the Week one of the rarest Volkswagens in the world. It’s also extremely desirable since it has everything an enthusiast wants. Eight cylinders, all-wheel drive, and a six-speed manual gearbox. Better yet, nobody knows what it is. The only outward signs are a small W8 badge on the grille and a matching one on the trunk. Outwardly you’re just driving a regular 2004 Passat until you downshift and hit the gas. Then things become more obvious very quickly. This Passat W8 sedan has just 93,000 km. It’s a beautiful indigo blue with beige leather interior. The current owner says he’s had it for about a year, but too many cars in the driveway means that it’s time for this one to move on. 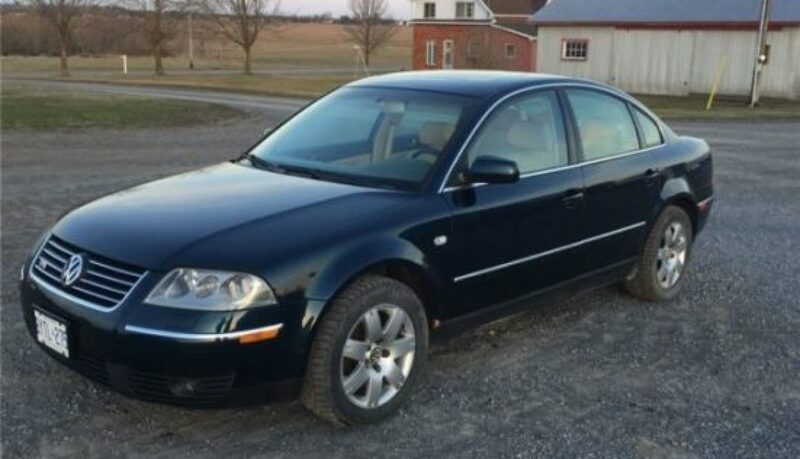 If you’re interested in this rare, eight cylinder VW, here’s your chance, and it’s for sale in Saint-Pascal-Babylon, Ontario (about 50 km east of Ottawa). Oh, and Volkswagen made a wagon W8 too. If you prefer a wagon but are ok with an automatic and some…interesting modifications, then give this one a look. When I picked up the 2017 Volkswagen Alltrack, it didn’t make any sense to me. Why would anyone want a Golf wagon that was lifted an inch? 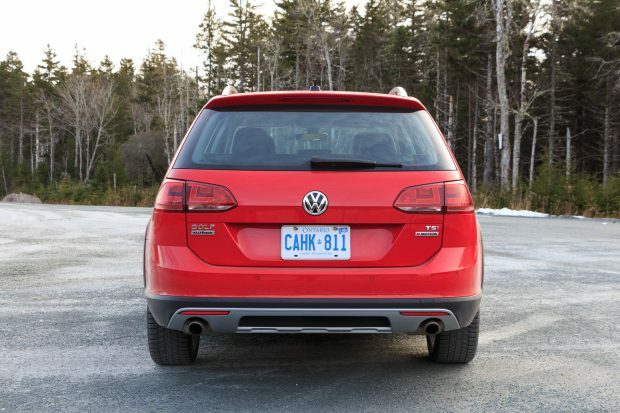 Why do grey fender flares and mirror caps justify a price hike of $1,500 over a Sportwagen? Sure Subaru’s been doing this formula for years with their various Outback models, but even they gave up and separated the Legacy and Outback models. Then I got out of the Alltrack, and suddenly it all made sense. The appeal here isn’t the grey trim and the “off road” looks. That’s just part of what you have to do to play in this field. The appeal is that extra 1.4-inches of height. Cars are low to the ground, with fairly small doors. Since I’m not 25 anymore, and neither are most of the people buying cars, getting down into a low car can be difficult. Adding some ride height raises the seat just enough to make the Alltrack massively easier to get in and out of than the Golf. So the question isn’t why did they do it, but rather did they do it in a way that spoils the goodness that is the 7th generation Golf. 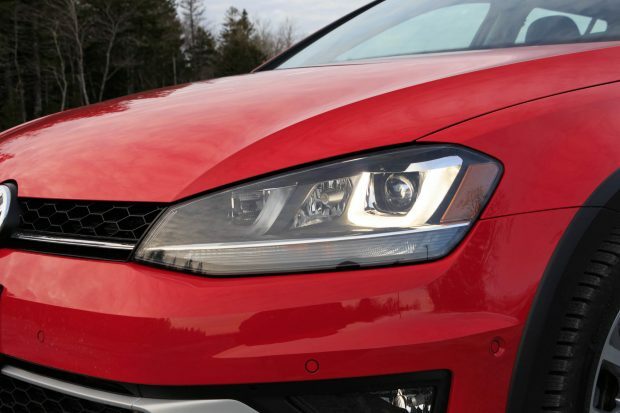 The short answer is no, so if you already like the Golf, you can probably stop reading here. Or watch my video of the Golf R. The long answer is a little more complicated. 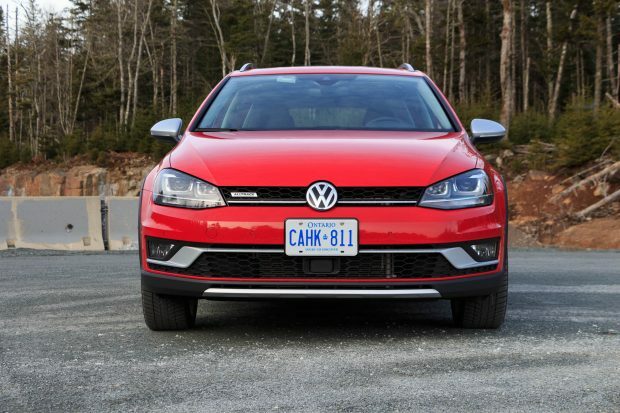 VW has long proclaimed that if you want a driver’s car that they’re the ones to go to. Mazda might disagree, but having two companies fight over who makes affordable cars that are fun to drive is the best thing that could happen to enthusiasts since the horsepower wars that started around 2002. The Golf is an excellent car to drive. It feels incredibly solid, it’s well planted, and the suspension encourages you to throw it into corners. The seats are well bolstered to keep you in place, and VW’s manual and dual-clutch automated manual transmissions are both a joy. Raising the roof does nothing to hurt that. 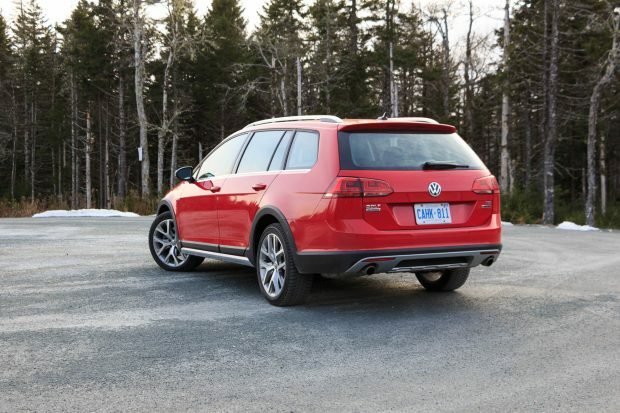 The Alltrack does roll more than lesser models, but it never wallows or becomes ungainly. The sidewalls are a touch taller, to help with off-road capability, but it takes just the slightest edge off the roadholding. You can tell that it’s a little bit taller, but that shouldn’t cause you hesitation before tossing it into a bend. Hitting just the wrong type of washboard pavement can briefly unsettle the Alltrack, but there was only one particularly bad spot I could find that would cause that. Volkswagen’s 4Motion all-wheel drive is a front based system, but it sends power rearwards quickly. In the snow, the Alltrack was delightfully tail happy. Unfortunately, the stability control can’t be shut off, which dampens the fun considerably as it curtails your perfectly executed slides. It does allow much more sideways that you might expect before it intervenes, though. The Alltrack is solid in more than just handling. The Golf family generally feels as solid as a bank vault, and this is no different. There are no creaks, groans, or rattles from the interior, even with the 400-watt Fender audio system cranked. There’s long been something about the Golf, and it extends to the Tiguan and Touareg (although, sadly, no longer to the Jetta or Passat). You know as soon as you look at it that you’re in a VW product. Everything looks as Teutonic as it feels. The controls for the ventilation system are close at hand, with clear dials and button that are simple to use. The infotainment system uses a 6.5-inch touch screen that is small by current standards, but it’s fairly responsive and functional. There are screens that coach you to improve your fuel economy and an “off-road” screen that gives you steering angle, compass heading, and altitude.The system also supports Apple CarPlay and Android Autos. 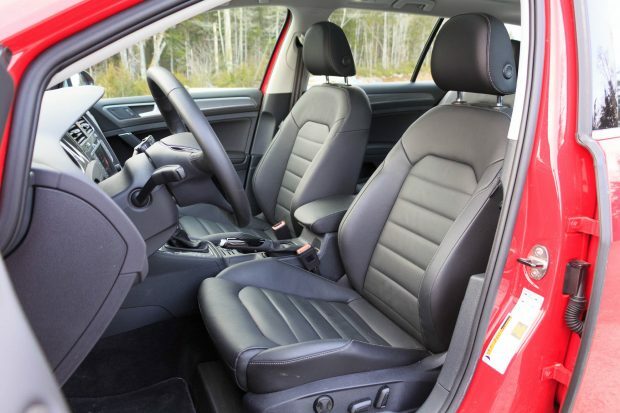 The heated and power adjustable front seats are leather, with heavy bolsters. I found the bolsters to be more of a hindrance than a help because they make for a very narrow gap between the steering wheel and the edge of the bolster. If you’re large of stature, then you may have trouble fitting your legs between the flat-bottomed wheel and the seat cushion. I haven’t experienced this problem in other Golfs, so it may be unique to the positioning of the seat and wheel in the Alltrack. A comfort-entry with power telescoping wheel and automatic sliding back of the seat would do a great deal to help here. 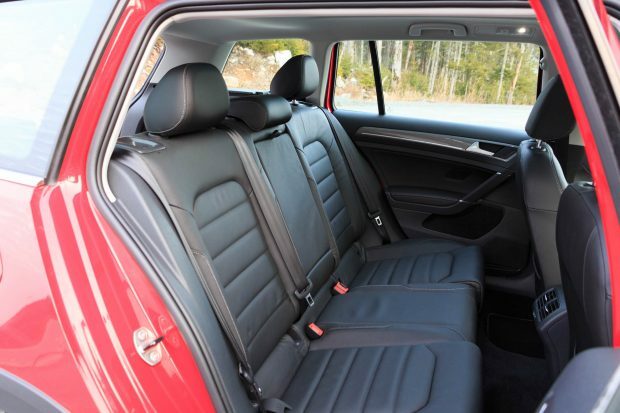 Behind the front seats, space for rear passengers is adequate for two, but three adults are going to become well acquainted if they spend time back there. The seatbacks are 60/40 split folding, and when folded reveal a large cargo area. There is 860L of space behind the rear seats, and 1883L with the seats folded. It’s a lot of space for anything you want to put back there. 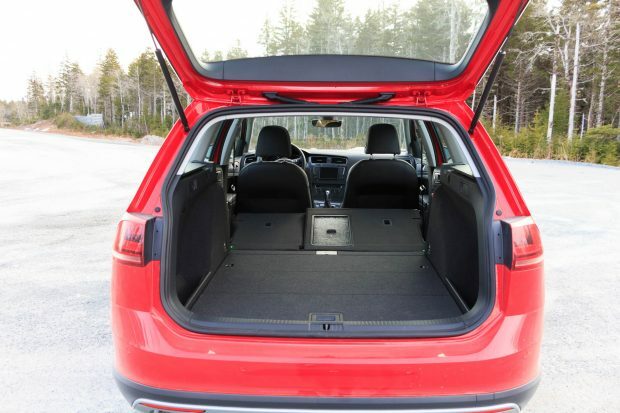 Alltracks come with a cargo cover to keep your stuff hidden, and there is a 110-volt power outlet in the cargo area. 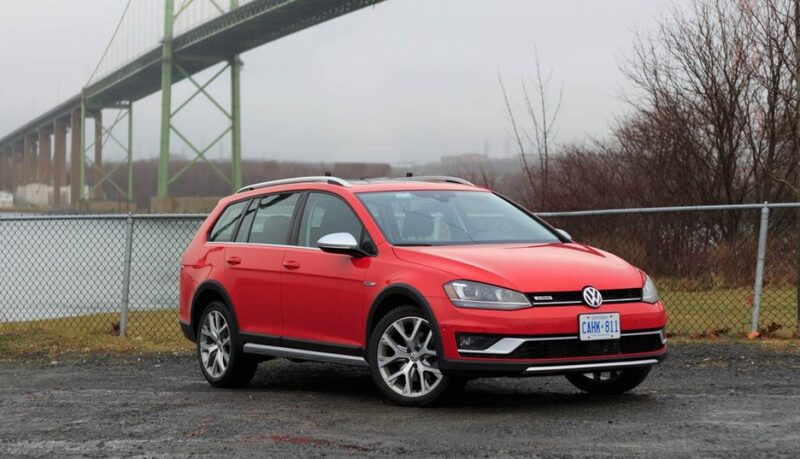 Pricing and availability for the Alltrack compared with the Sportwagen can be confusing, especially as they are configured very differently between the US and Canada. 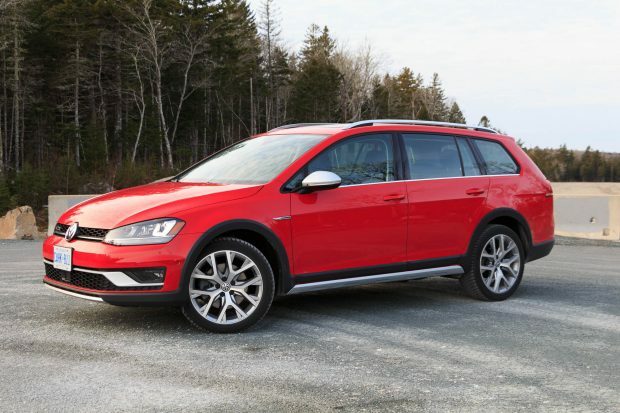 In the US, the Alltrack comes in three trims, and the only Sportwagen available with 4motion is the base model. 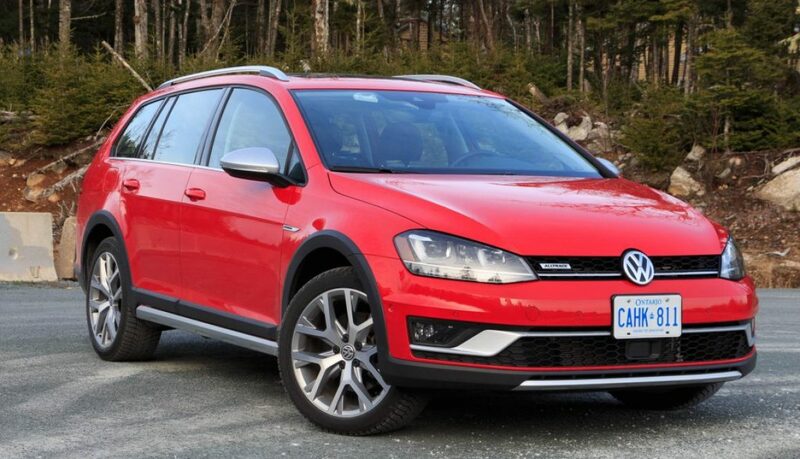 In Canada, 4motion can be had on all Sportwagen trims, and the Alltrack comes in just the top trim. That also makes it more difficult to see how much weight the Alltrack has gained, but it appears to be around 80 kg. The Alltrack is rated to get slightly worse economy than the front-drive Sportwagen due to the weight and height changes, and it gets about 3 L more fuel capacity to compensate.My Alltrack was a Canadian car and was equipped with the $1,310 driver assistance package that includes radar cruise control, emergency braking, lane guidance, and park assist, as well as the $1,610 light and sound package that added the Fender premium audio, adaptive bi-xenon headlights, and automatic high beams. That put the sticker at $38,215. For that, you also get push-button start and proximity keyless entry. The seats are heated, but surprisingly for this price point, the steering wheel isn’t. Look up, and there is a massive panoramic sunroof that opens up most of the way back. The driver assistance package’s park assist will park the car for you, in both perpendicular and parallel spaces, but if you don’t opt for that a back-up camera is standard. The Alltrack has four selectable driving modes that make changes to the power steering effort and throttle response. There is normal, comfort, customizable individual, and off road. Off road softens the throttle response and keeps the car in a lower gear to improve off road performance. It also enables hill descent control that is like cruise control for slow speeds. The mode certainly helps on dirt lanes and roads, but it doesn’t turn the Alltrack into a rock crawler. But really, the rutted road to the cottage is the most off-roading this type of car will ever see anyway. 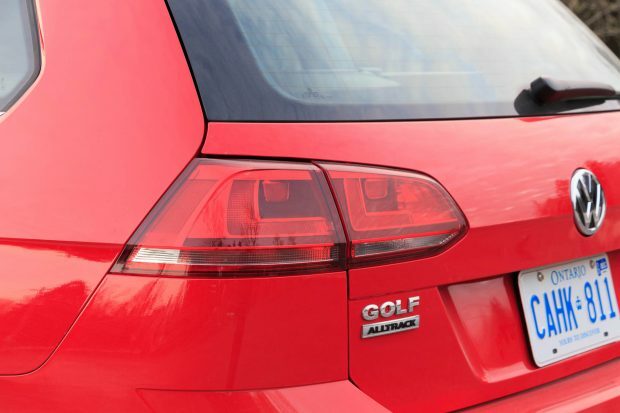 If you’re looking for a Golf wagon and want one that’s a little easier to get in and out of, then the Alltrack will be right up your alley. At least if you’re looking for one that’s loaded. 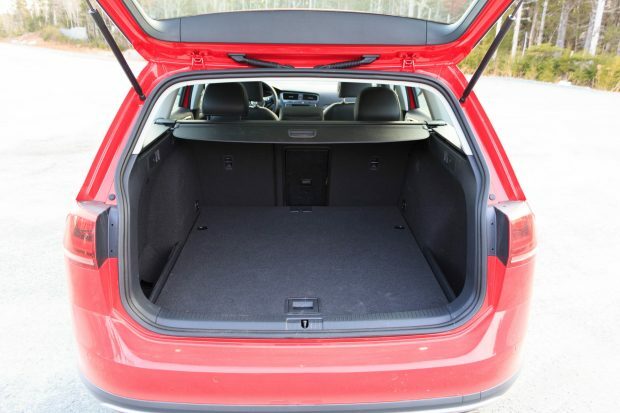 If you don’t need the extra height, or don’t need every single bell and whistle, then you’d probably be better off with the regular Sportwagen. It mostly sits alone as a small wagon with all-wheel drive. It doesn’t compare with the Subaru Crosstrek, but it’s smaller than the similarly priced Outback. In isolation, this is a great platform with excellent handling, plenty of space, and loaded with features, but in the real world, it is let down by poor fuel economy and a big price tag.